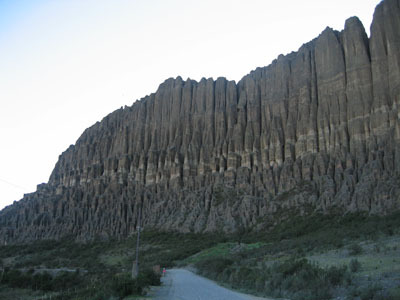 This area is striking for its geological formations shaped like spires or needles grouped by the hundred in bunch and rows that reach to great heights. Some look like the great pipe organs and other resemble petrified souls. There is sparse vegetation, mostly grasses and small shrubs. Birds such as sparrows and Ave Marias flitter about. The Ánimas Valley mesa and lake offer enchanting views of the Illimani and other peaks of the Cordillera Real mountain range. 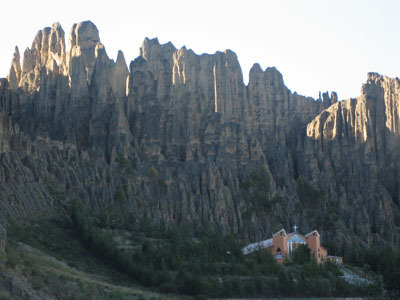 The Ánimas Valley is located in Ovejuyo about 4 km. form the southern La Paz district of Cota Cota.